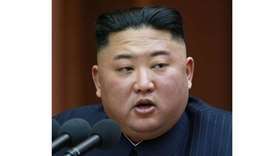 North Korean leader Kim Jong Un said his country would soon test a nuclear warhead and ballistic missiles capable of carrying nuclear warheads, the North's KCNA news agency reported, in what would be a direct violation of UN resolutions which have the backing of the North's chief ally, China. 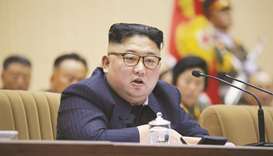 Kim made the comments as he supervised a successful simulated test of atmospheric re-entry of a ballistic missile that measured the ‘thermodynamic structural stability of newly developed heat-resisting materials’, KCNA said. ‘Declaring that a nuclear warhead explosion test and a test-fire of several kinds of ballistic rockets able to carry nuclear warheads will be conducted in a short time to further enhance the reliance of nuclear attack capability, he (Kim) instructed the relevant section to make prearrangement for them to the last detail,’ the agency said. South Korea's defence ministry said there were no indications of activities at the North's nuclear test site or its long-range rocket station, but that North Korea continues to maintain readiness to conduct nuclear tests. 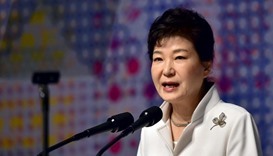 South Korean President Park Geun-hye said the North would lead itself to self-destruction if it did not change and continued the confrontation with the international community. 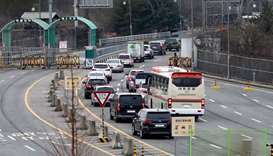 The North's report comes amid heightened tension on the Korean peninsula as South Korean and US troops stage annual military exercises that Seoul has described as the largest ever. In the apparent re-entry simulation, the official newspaper of North Korea's ruling Workers' Party carried pictures on Tuesday of a dome-shaped object placed under what appeared to be a rocket engine and being blasted with flaming exhaust. 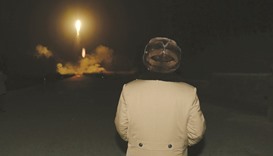 In separate images, Kim observed the object described by KCNA as a warhead tip. 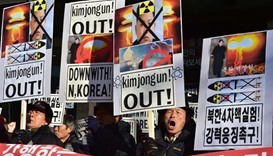 The North has issued belligerent statements almost daily since coming under a new UN resolution adopted this month to tighten sanctions against it after a nuclear test in January and the launch of a long-range rocket last month. In 1962, the United States launched a ballistic missile with a live warhead in what was known as the Frigate Bird test. 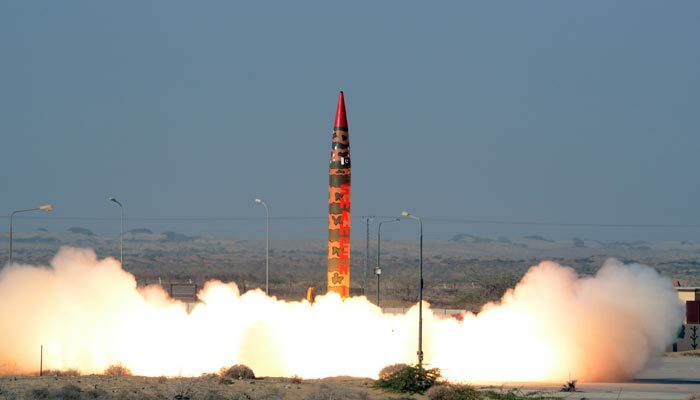 China conducted a similar test in 1966. ‘What would be terrible is if the DPRK (North Korea) re-enacted Operation Frigate Bird or the fourth Chinese nuclear test and did a two-in-one,’ said Jeffrey Lewis of the California-based Middlebury Institute of International Studies. South Korea's defence ministry said after the North's report that it still does not believe the North has acquired missile re-entry technology. 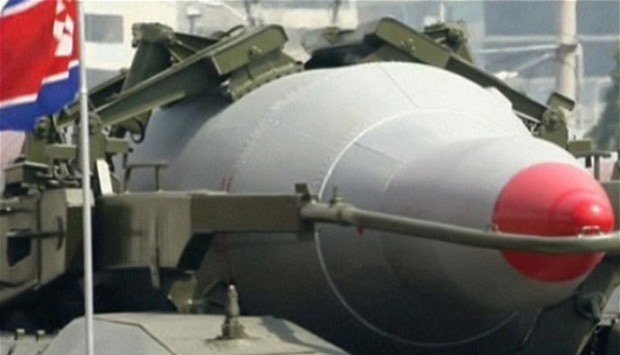 US and South Korean experts have said the general consensus is that North Korea has not yet successfully miniaturized a nuclear warhead to be mounted on an intercontinental ballistic missile. More crucially, the consensus is that there have been no tests to prove it has mastered the re-entry technology needed to bring a payload back into the atmosphere. 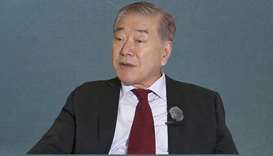 Kim said last week his country had miniaturized a nuclear warhead. 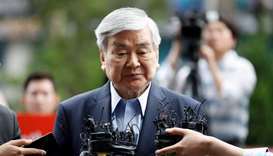 The North, which has conducted four nuclear tests, also claims that its January nuclear test was of a hydrogen bomb, although most experts said the blast was too small for it to have been from a full-fledged hydrogen bomb. The North also says the satellites it has launched into orbit are functioning successfully, although that has not been verified independently. 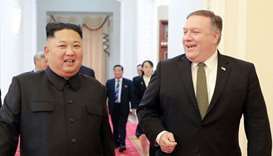 North Korea rejects criticism of its nuclear and missile programmes, even from old ally China, saying it has a sovereign right to defend itself from threats and to run a space programme putting satellites into orbit. 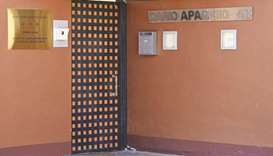 China's Foreign Ministry on Tuesday urged prudence. ‘We urge all the relevant sides to conscientiously carry out what is required by the UN Security Council, speak and act cautiously, and all relevant sides must not take any action that would exacerbate tensions on the Korean peninsula,’ said ministry spokesman Lu Kang at a regular briefing. The new UN Security Council resolution sharply expanded existing sanctions by requiring member states to inspect all cargo to and from North Korea and banning the North's trade of coal when it is seen as funding its arms programme. The foreign ministers of South Korea and China discussed the new sanctions against North Korea by telephone late on Monday and agreed it was important to implement them ‘in a complete and comprehensive manner’, China said on Tuesday.